Booth Listings for Gear Expo 2005 in Detroit. The objective of this research is to develop a new lapping process that can efficiently make tooth flanks of hardened steel gears smooth as a mirror. Guidelines are insurance against mistakes in the often detailed work of gear manufacturing. Gear engineers, after all, can't know all the steps for all the processes used in their factories. Bevel gear manufacturers live in one of two camps: the face hobbing/lapping camp, and the face milling/grinding camp. Wait a minute, we don't measure pitch diameter. We're sometimes asked to measure it by customers, though, especially ones with older drawings. Most firms in the gear industry we've talked to over the past year are making more gears than ever, generating more sales, and filling up their schedule books into next year and beyond. The complete Product News section from the September/October 2005 issue of Gear Technology. 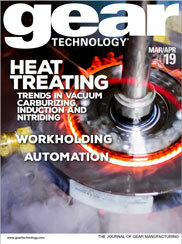 The complete Industry News section from the September/October 2005 issue of Gear Technology. A gear lover's crossword puzzle, courtesy of the Addendum team.